There is nothing like the feeling of walking into a project that I’ve been designing for over a year and finally to see the finishes installed. That’s when the “house” is really turned into a “home.” It gives me such a great sense of pride to see how beautifully things come together to make the interior design a reality. Today I got to see two custom designed artwork panels by Shagreen Art installed in the staircase of one of our residential clients. I was inspired by panels I had seen at a designers showhouse years ago. I modified the design to fit my client’s house and I am truly exhilarated! 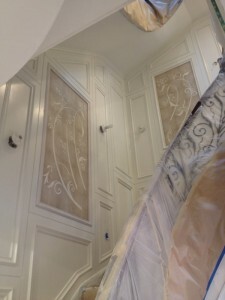 The panels integrate so well into the overall design and I can’t wait to see the spaces finished. I love it and so does the client!